Being the mother of four active boys has filled my life with a myriad of experiences, some more exciting than others. Since they all four have gone to the same high school, I've almost worn the pavement down on the road over the last eight years taking them to and from school. Day after day, I began to notice this one particular man, a tall, older, distinguished looking gentleman. Every morning, there he was walking with his lunch bag in hand and a lanyard I.D. tag hanging from his neck. I naturally assumed he was walking to work. One special morning I heard God's still small voice on the inside of my heart telling me to pray for the man. I snorted," Lord! I don't even know that man! How could I pray for him?" The gentle voice replied, "You see him every day! Why don't you make a difference in his life instead of just blowing past him? Be aware of the people who cross your path on a daily basis. Reach out to them." The next day the same thing. Now, I have had a relationship with God for 36 years. And in that 36 years I have learned to hear God's voice the hard way. Funny, the more time I spend with God the more sensitive I am to Him when He talks to me. Kind of like the saying "The harder I work the luckier I get" type of thing. Anyway, I obeyed, and I began to pray for him every morning when I saw him. I would pray for God to bless him and his family, for God to give him a good day. I would pray for his health and his job. I began to pray that God would help him with any problems he might be having and for God to fill his life with love and meaning. Well, this went on month after month. Were my prayers making a difference in his life? Was my obedience in praying for him making a difference in mine? Now, I have the best job in the whole world. I am the head of the greeting card department at Berean Christian Store in Bakersfield, California. I get to talk about God all day long at my job. I get to pray with people, listen to Christian music, and be surrounded by godly literature. Who could ask for anything better? As in all retail business, working with the public has its challenges- Christian or non. One day I was having a particularly difficult time of it and as I was putting up my greeting card order I kept coming across Roy Lessin's poem titled "Just Think.” It seemed that everywhere I looked on this day that poem was there: On a plaque, on a journal, in framed wall art. I thought to myself, "Come on, Roy, get a new poem now and again. Let's get some new material going here!" As they began to look at the baby cards, I could not help but overhear because I was putting up product just a few feet away. They read a few cards out loud together, talking in hushed tones. Then they began to read a baby card with the poem (you guessed it) “Just Think” on it. As they began to read this card, they both started to softly cry. Then the words they read began to be broken with sobs in between. Before long, they were both weeping. I was so moved with compassion for this hurting Grandpa and Grandma, and they had no idea who I was or that I had been praying for them for many months! I couldn’t help myself. With tears in my eyes, I wrapped that little woman in my arms and began to pray for her, the daughter, and the baby who were obviously so very precious to them. She sobbed in my arms as I prayed. And just as quickly as they came in, they were gone. I was left standing there with the most awe-struck feeling. What just happened? God came down and touched my world! What did I learn that day? So many things!! Like, some things are TIMELESS. For instance, an old poem that was written years ago under God’s power and anointing can, and is, still touching lives today. Similar to the Bible, God continues to encourage and motivate man through the written word. God’s insights are fresh and new, no matter when they were written! The power of words, especially when they are inspired by God. I also learned that God has His reasons when He asks you to do something. I’ve come to realize, over time, that He has my best interest at heart. His instructions may seem insignificant, but if you will obey Him and do what He says, He will make something surprisingly beautiful (serendipitous!) out of your obedience. Like me, maybe you will get to help someone in their time of need. Or, the tables could be turned, and you will be the someone in need who is greatly helped by the one who is being obedient to the whisper of God. I continue to drive two of my sons to high school every day and I still see that man walking to work. You can bet that every time he is seen, I habitually pray for him and his family. He probably will never know who I am, and that’s okay. The satisfaction of being obedient and knowing why ... so I could be a help and an encouragement, is enough to warm my heart and prepare me for my next adventure with God. 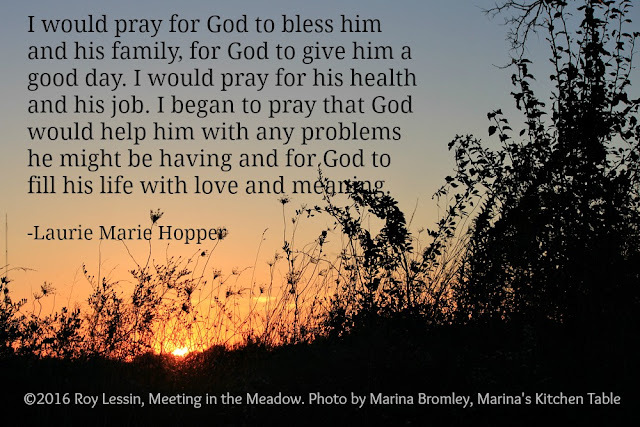 You may read the poem "Just Think" by Roy Lessin, at DaySpring.com's website here.